What do Qt 5, Linux 3.8 and LibreOffice 4 have in common? They were not released in time to be included in our leading edge, but stable openSUSE 12.3 in time. But fear not: the power of the Open Build Service comes to the rescue! 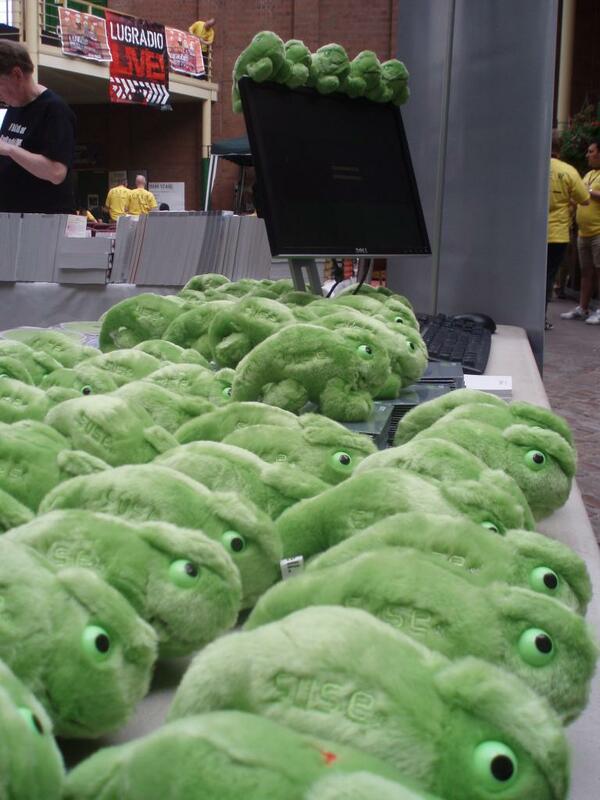 The herd of almost 35000 Geekos working there creates a wide variety of packages for openSUSE 12.3 and we’ll highlight a few of those in this article. But first, let’s talk about openSUSE 12.3. On December 20 last year, our development tree ‘Factory’, which contained the latest and greatest Free Software had to offer at that time, went into ‘Stabilization freeze’. The goal of this freeze is to make sure things stop breaking and can get tested. From now on, adding new major versions of software in openSUSE is not allowed without an rationale why this major version would be as stable, or more, as the previous one. The translation teams get to work at this time as well. The goal of all this freezing is of course to make sure all the software cooperates properly and is stable. Without it, we can’t give you the stable workhorse that will be openSUSE 12.3! For the majority of users, openSUSE 12.3 is a great product offering exactly what they need: an awesome tool to get work done with. Stable and dependable, like you’ve gotten to expect from us. Y you no want stable? You can do that in openSUSE, but as Spiderman’s uncle said, “With great power comes great responsibility”. Stable release of openSUSE are thoroughly tested to make sure that everything works together well and you won’t encounter unpleasant surprises. But the more packages you install from other sources, the further you get from a stable release and move into uncharted territory where packages may or may not play nicely together. Our package manager zypper and the Open Build Service we use for building packages probably offers the best platform available to ensure stable software in the event of having many different sources – the average openSUSE user has over 10 repositories. And the risks can be managed. But you can not say that we didn’t warn you! Maintenance – When you have a choice, pick packages from the devel projects over those from the home of users. Devel projects are the workshops where packages are prepared before hitting openSUSE Factory. Â There are no guarantees but often devel projects are better maintained and more trustworthy! Recognize home projects by their home: prefix. Security – When you install a package with one-click-install, the repository gets added and you must trust the developers’ key. Once you have a bunch of repositories, a zypper dup command can switch packages over from the main repositories to all your other added repositories. This could get messy AND presents security issues, so check carefully what happens! So where do they come from and how to get them: fresh packages. The Open Build Service is “A generic system to build and distribute packages from sources in an automatic, consistent and reproducible way.”. In real life, that means: OBS is a platformÂ which compiles software, packages it, and puts it on a download server for manual download via a webpage, or your distro’s package management system. And it’s free – both as in fully GPL licensed and developed in the open, as well as free to use on the sponsored build.opensuse.org instance. We use this server to develop openSUSE, and we and thousands of others build packages there. Installing software from build.opensuse.org is easy thanks to our One Click Install technology. You don’t have to enter command line instructions like most other distributions demand from you – it’s easy and fast. You can find the application or library you are looking for with the software search on software.opensuse.org and install it with just a few clicks. Check the video below for a demo! A few high profile applications and libraries which didn’t make it into openSUSE 12.3 include Qt 5, LibreOffice and of course the new 3.8 kernel. There is also software which is not very suitable for the official openSUSE repositories due to size or other reasons. Games are a prime example of this, and they too can be found on software.opensuse.org. Let’s get over some examples, shall we? Shortly after feature freeze the new LibreOffice came out. There are new shiny features in version 4.0 like personas (support for Firefox theming), accelerated multimedia previews or remote control of your presentation from an Android device. There are also improvements like better quality of RTF and Visio import or improved performance during imports of various formats. If you can’t live without these features and if you were waiting for them so long you can’t take it anymore, there are of course LibreOffice repositories in OBS. The LibreOffice team maintains a wiki page with info on what is there and you can also get your fix from software.opensuse.org/package/libreoffice! Games are one category that is not easy to cover inside a distribution. On one hand we have off-line games with huge data files that needs to be installed and on other hand MMOG games which need to connect to the server using the latest API’s and have to be updated regularly. Both of them are not a good candidates for regular distribution packages. But don’t worry, you can still play a lot of games in openSUSE, they are just in a separate repository. The easiest way to find them is to look in the the openSUSE Games category and pick the ones you want from there. Are you huge Gnome fan? Can’t live without latest KDE software to see what cool stuff is going on? We’ve got Gnome and KDE repositories for you. So you can be using the latest version of your favorite desktop environment even though it wasn’t stable yet during our feature freeze or just be sure of the endless stream of fixes. But be warned. KDE and Gnome contain and depend on a huge number of new libraries, so they can make a mess if you mix too much. The wiki pages above give enough tips on how to add the newer GNOME and KDE repositories – keep in mind that the Factory one can be very unstable! Not only the desktops are available in such devel repos but so are many other things. You’ll find them when finding your packages in the search on software.opensuse.org. Are you a developer and do you want to get your applications ready for future? Or do you want to use some new killer feature found only in the latest versions of some libraries? Don’t worry if they were not stable at the time of feature freeze. You can find the latest versions of a large number of libraries in Open Build Service. For example we have an experimental repository with Qt 5. You can start looking into it, playing with the newest QML and other features or check the promise made by the qt-project that upgrading from 4 to 5 will be easy. If you search hard enough, you’ll be able to find that somebody is already testing Ruby 2.0 in his home repository. Yes, a home repository, so highly experimental, can be broken and can contain serious bugs. But on the other hand, you can expect, that if there is a work in progress, it is just a matter of time before it ends up in some better non-home repository with some more testing. And if you encounter issues, the Open Build Service is like github for packages: forking and fixing is easy as pie. Or, BURPing. See for some tips this article! Or are you interested in embedded development? OBS also provides the latest version of the AVR crosscompiler. In some home projects you can find development tools for msp430. But if you are developer and you are developing software that needs specific libraries, there is always an option to get anÂ OBS account, get all the needed libraries into project in your home, package your own software and share it with the world! So, there you have it. Lots of choice – that is what we are about, after all. Now, just wait two more days, and openSUSE 12.3 is ready for you. If you keep in mind the risks and steer around them, you’ll have a lot of fun with software.opensuse.org and the packages from OBS! Thanks for providing latest Qt and KDE software in openSUSE 12.3. Using RC2 and love it. Could qt4-devel and qt5-devel be made co-installable? Also, could you add a weekly build of “dev” branch? I really would like to start helping with KF5 development. Dear Sir, Your team is doing great thing. Thanks very much for that. For many days one issue is bothering me very much and with your kind permission I will say what it is. In the earlier days, that is SUSE professional 9.1, 9.2, 9.3, 10.1,10.3 the user could install both GNOME and K.D.E DESKTOPS, and switched between them as desired. Why that is stopped, and whether this facility could be again made available? That was and is still functioning in all 11 versions and in 12.1 and 12.2. I have no doubt it will also in 12.3. I do not know where you based this on, but when you have technical problems installing KDE, Gnome and other desktops side by side on openSUSE, please go to forums.opensuse.org for technical help. Already tried that, though I’m switching between KDE versions (3.5.10 and 4.10). Works fine. Why PHP is still in version 5.3? And available updates from OBS does not include many useful extensions like imagick? There are also many unresolved hardware bugs in kernel. I appreciate Your work but I must also admit that the updated environment of 12.2 started working terribly slow. I am not privy to what goes on with PHP or other languages much – it is possible the team decided to keep on 5.3 due to performance or there was simply nobody able or willing to do it. I’m not sure why PHP old, but that seems to be a problem rather than a consensus that 5.3 is better than 5.4 for whatever reason. On the bright side, 5.3.x is being actively maintained so it has tons of bugfixes by now, and we’ll surely be seeing a newer PHP in 13.1.
just want to say that zypper + OBS is the best package management system I’ve ever encountered: fast, easy, and perfect for mixing-and-matching your repos. Vendor-stickiness is a must and I’ve only found it in SUSE! Will you be making sure that the Qt 5 packages in the repositories will be installable alongside Qt 4? I develop a Qt app which I have made compatible with both, but I tried installing Qt 5 from the repositories and it conflicted with Qt 4. The same conflicts don’t happen with Qt 3 and 4. It’s easier to build Qt 5 from source at the moment. Steam for Opensuse Please …. or else i will have to go Ububtu!! :-( …. Where can I get/buy one of the plush geckos? Unfortunately we only have them at events IF they are in stock. At some point I’d love to set up an online shop but that’s a plan for the future. Hi Guys, Just want to say I have been running opensuse 12.3 on a couple testing machines and plan to upgrade my “stable machine” on the weekend or sooner when 12.3 comes out so far so good :). I Love how easy it is to add repos that contain the more up to date packages and how they tend to work and when they don’t it is normally a case of disable and zypper dup and we’re back. great work and that thanks so much for making it posible. After using 12.2 for an year and after mess up the configs and programs, I urgently need to reinstall openSUSE, this means this new version came from Heaven! I truly advice use openSUSE for starters or experts. Having a Desktop or Server with openSUSE is always a good experience in our life’s computing. Thanks for the great article, Jos. I have been one with multiple boot partitions – one stable, and one playground. openSUSE is broad enough to allow me to use it for BOTH – thanks to the OBS and all the other things you mentioned. Great! Good job OpenSuSE team!